Posted April 23, 2016 by Tony Jones & filed under Books. 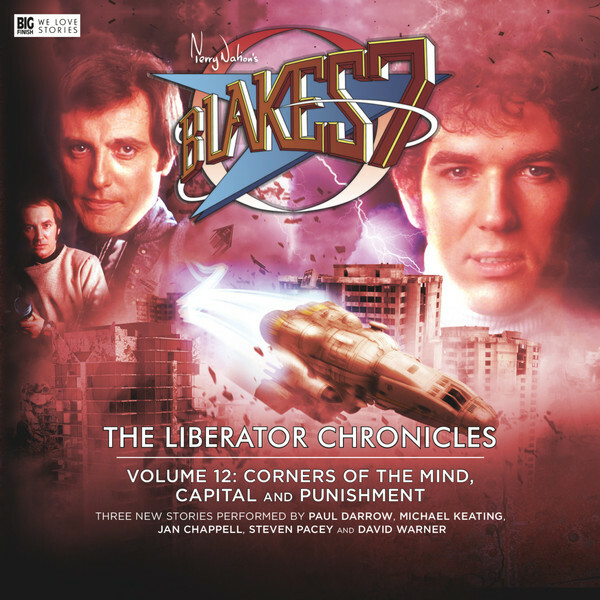 The Liberator Chronicles from Big Finish have come to a conclusion with the release of the this set of Blake’s 7 stories. Big Finish released Volume 1 of the Liberator Chronicles in February 2012, and since then has released twelve sets of three one-disc stories, a special story (Warship) in 2013 reuniting the full cast for the first time and two full cast series of six adventures each. Now these wonderful stories are coming to an end, and they do so with a bang rather than a whimper. The first story is Andy Lane’s Corners of the Mind a two-hander between Paul Darrow’s Avon and Jan Chappell’s Cally. The setting is a labyrinth of puzzles that start off with some standard mathematical puzzles and moves to more practical matters. This is an odd choice for audio as much time is spent getting Avon to describe his setting to Cally, rather than actually solving the puzzles and saving his life. On another level there is a deeper puzzle also to be sold – something is taking his mind apart, piece by piece. Masterfully told yet perhaps a strange choice for audio. The second and third stories are Guy Adam’s Capital / Punishment. These refer back to the theme of an earlier set of adventures (The Armageddon Storm) and also bring back David Warner’s character Tavak. Big Finish has had several massive ideas in its return to Terry Nation’s Federation, and these two ideas are among the best and a fitting way to end the series of Liberator Chronicles. Capital puts Steven Pacey’s Tarrant in desperate straits as he tries to escape from a doomed world with the rest of the Liberator crew captured. The telling is very claustrophobic and even if we know the characters must survive, the tension is genuine. His mission is to get a message to the one person able to help, an alcohol soaked Villa (Michael Keating). The final story, Punishment, expires Villa’s relationship with Tavak and the two stars are brilliant. Lisa Bowerman brings Guy Adams’s tale to life with great effect and the timing and pacing are superb. The series may be over, but stories like these mean it will be missed, and the pressure to continue telling such great stories can only rise. Another triumph.